There is another little gem I found in a very old document which caught my eye, and although it may not seem significant to most readers, there are some who will see it. Some time thereafter they [the conspirators] sent from the pueblo of Los Taos through the pueblos of the custodia two deerskins with some pictures on them signifying conspiracy after their manner, in order to convoke the people to a new rebellion, and the said deerskins passed to the province of Moqui, where they refused to accept them. The pact which they had been forming ceased for the time being, but they always kept in their hearts the desire to carry it out, so as to live as they are living to-day. Finally, in the past years, at the summons of an Indian named Popé who is said to have communication with the devil, it happened that in an estufa of the pueblo of Los Taos there appeared to the said Popé three figures of Indians who never came out of the estufa. They gave the said Popé to understand that they were going underground to the lake of Copala. He saw these figures emit fire from all the extremities of their bodies, and that one of them was called Caudi, another Tilini, and the other Tleume; and these three beings spoke to the said Popé, who was in hiding from the secretary, Francisco Xavier, who wished to punish him as a sorcerer. They told him to make a cord of maguey fiber and tie some knots in it which would signify the number of days that they must wait before the rebellion. He said that the cord was passed through all the pueblos of the kingdom so that the ones which agreed to it [the rebellion] might untie one knot in sign of obedience, and by the other knots they would know the days which were lacking; and this was to be done on pain of death to those who refused to agree to it. As a sign of agreement and notice of having concurred in the treason and perfidy they were to send up smoke signals to that effect in each one of the pueblos singly. The said cord was taken from pueblo to pueblo by the swiftest youths under the penalty of death if they revealed the secret. Everything being thus arranged, two days before the time set for its execution, because his lordship had learned of it and had imprisoned two Indian accomplices from the pueblo of Tesuque, it was carried out prematurely that night, because it seemed to them that they were now discovered; and they killed religious, Spaniards, women, and children. According to the Aztec record the Aztec left, were expelled, or forced to depart from their ancestral home land Aztlan, it is not said as to why, however it is expressed that it was in humility. From this I can only surmise the humility was with respect to, knowing they had not abided by the laws of their God, the results of which could have been war, famine or similar. From this place of the Heron, they went south to what is referred to as Seven Caves, that the Seven Families who left Aztlan went to inhabit, one family to each of the seven caves. It is said that six of the families stayed in the caves for near 200 years, those who called themselves specifically the Aztec stayed for about 300 years and were the last of the seven families to leave the caves and travel south. The people in their record that they encountered and fought with in Mexico were the former families who had left the caves 100 years prior, these six families were known by other names. The Aztec family left the cave they inhabited in about 1000 to 1100 AD. The Caves that the seven families went to after they left their homeland of Aztlan, had been known to them for many hundreds of years. The caverns were in fact underground cities built by a previous culture near 2000 years previous, it is said about two specific underground cities in the caverns, that they are capable of housing 50,000 people. The reasons the caves were built can only be speculated but I could say the reasons why we as a society might go underground today, and the first thing that comes to mind is religious freedoms. These seven caves along with a possible three or more others were abandoned prior to 600 BC. The people who lived in these caves had what seems to be a similar if not a precursor to what is now known as Hinduism and even the later, Buddhism. It would seem they held in high regard the same entity which has evolved to a deity, Buddha or Vishnu. 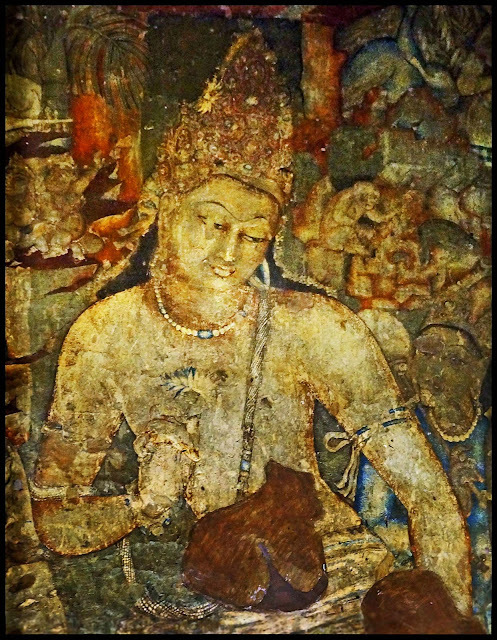 Those things which are found or have been found in the caves, suggest a pre Buddhist people but more so suggests the early form of Hinduism, in fact I would suggest looking to the caves of Ajanta to see the workings of the very same people. There is a story among some Utes, a story about a large ancient underground city. The location of this cave had become unknown to them with just retained descriptions of where it was and how to find it as the woman last given charge of it had passed away. This information was shared with a friend in recent years, this friend is quite sane, level headed with common sense and a well balanced degree of skepticism. If he told me the sky was purple, I wouldn’t bother looking as he is a honest as the day is long. A Ute friend of his and son of the old woman had shared with him all the details that he was able to remember from his mother. My friend felt he knew where to find it and for whatever reasons he chose to believe the story I do not know as I would have thought he would have brushed it aside as a fairy tale. Not many years ago searching the area explained to him, my friend found a tunnel as he was told he would, a tunnel which the entrance is difficult to find in that you could be standing next to it and not know it was a tunnel, the reasons I will withhold. When he started entering the tunnel he was to his ankles in water, and after following the tunnel for about 100 feet he was to his armpits in water, there in front of him was a very large stone double door. He explained the doors were of the height of 9 feet and clearly made with great skill. It was all he could do to not open the doors for if it were not for a simple fact, there is no doubt he would have found a way, however, he noticed that above the water level in which he was standing and to the top cracks of the doors, water was leaking out, a clear indication of what would happen if the doors were to open. Plans are being made to further investigate. This particular location is clearly marked on the old Latin Maps and is possably one of the 7 cities of Cibola which by the way is properly pronounced as Ce-bo-la (as in Edward) not See-bo-la, this is NOT a Spanish word and was first written as Ceuola or Cevola. Among the many legends of Native Tribes of the Americas having emerged from the underground, legends of the Ant people who lived in vast underground cities there is one that stands out more than others told by the Paiute that leaves one pondering the writings of Plato. Many who have described the following and others like unto it, mention Egyptian LIKE people or artifacts, not to mention modern media are always found implying that Egyptians came to America in the past and this simply is NOT true. Let me just say it again, Egyptians NEVER left there own home land and are credited with more than they ever deserved or accomplished even in their own homeland. They were a lazy and slothful people who lived on the back of others from oppression and technologies of those who they miraculously managed to enslave. Egyptians did NOT built the many remarkable structures found in their land, but moved in and inhabited structures from a past civilization and everything built from that day forward were built by those whom they enslaved using their technologies and genius. The Egyptians of the past are credited with way to much intelligence such as the case of the presumed Egyptian Im-ho-Tep. If Champollion and Budge truly understood the Egyptian tongue, they would know it means May He (Yahweh) Increase and they could pronounce it correctly Ye-Ho-Sep[h] or as we might pronounce it today, Joseph who was NOT an Egyptian but was a Hebrew! Enough of this rant. When the world was young, and this valley which is now dry, parched desert, was a lush, hidden harbor of a blue water- sea which stretched from half way up those mountains to the Gulf of California, it is said that the Hav-musuvs came here in huge rowing-ships. They found great caverns in the Panamints, and in them they built one of their cities. At that time California was the island which the Indians of that state told the Spanish it was, and which they marked so on their maps. Living in their hidden city, the Hav-musuvs ruled the sea with their fast rowing-ships, trading with far-away peoples and bringing strange goods to the great quays said still to exist in the caverns. Then as untold centuries rolled past, the climate began to change. The water in the lake went down until there was no longer a way to the sea. First the way was broken only by the southern mountains, over the tops of which goods could be carried. But as time went by, the water continued to shrink, until the day came when only a dry crust was all that remained of the great blue lake. Then the desert came, and the Fire-God began to walk across Tomesha, The Flaming-Land. When the Hav-musuvs could no longer use their great rowing-ships, they began to think of other means to reach the world beyond. I suppose that is how it happened. We know that they began to use flying canoes. At first they were not large, these silvery ships with wings. They moved with a slight whirring sound, and a dipping movement, like an eagle. The passing centuries brought other changes. Tribe after tribe swept across the land, fighting to possess it for awhile and passing like the storm of sand. In their mountain city still in the caverns, the Hav-musuvs dwelt in peace, far removed from the conflict. Sometimes they were seen in the distance, in their flying ships or riding on the snow-white animals which took them from ledge to ledge up the cliffs. We have never seen these strange animals at any other place. To these people the passing centuries brought only larger and larger ships, moving always more silently. These strange people have weapons. One is a small tube which stuns one with a prickly feeling like a rain of cactus needles. One cannot move for hours, and during this time the mysterious ones vanish up the cliffs. The other weapon is deadly. It is a long, silvery tube. When this is pointed at you, death follows immediately. Once in the not-so-distant-past, but yet many generations before the coming of the Spanish, a Paiute chief lost his bride by sudden death. In his great and overwhelming grief, he thought of the Hav-musuvs and their long tube-of-death. He wished to join her, so he bid farewell to his sorrowing people and set off to find the Hav-musuvs. None appeared until the chief began to climb the almost un-scaleable Panamints. Then one of the men in white appeared suddenly before him with the long tube, and motioned him back. The chief made signs that he wished to die, and came on. The man in white made a long singing whistle and other Hav-musuvs appeared. They spoke together in a strange tongue and then regarded the chief thought- fully. Finally they made signs to him making him understand that they would take him with them. Many weeks after his people had mourned him for dead, the Paiute chief came back to his camp. He had been in the giant underground valley of the Hav-musuvs, he said, where white lights which burn night and day and never go out, or need any fuel, lit an ancient city of marble beauty. There he learned the language and the history of the mysterious people, giving them in turn the language and legends of the Paiutes. He said that he would have liked to remain there forever in the peace and beauty of their life, but they bade him return and use his new knowledge for his people. White-man does not yet know it as well as the Paiutes, and we have ever held it in awe. It is still the forbidden Tomesha—Land-Of-The-Flaming-Earth. I admit this is an incredible story and difficult to believe but it is not difficult to believe if one understands that man has not progressively developed his technologies since his existence but has achieved these levels of technologies several times in the past and understand that these technologies do NOT come as a result of the peoples own genius, but they come as a result of Obedience to the Laws of a God! And when the people stray from those laws, they loose the gifts they have been given. The people of the world today do not know that this is a blessed land, a promised land, but as a result it has a condition which in turn makes it a cursed land as well, but this is subject to those who inhabit this land and the choices they make using agency. It is decreed in heaven that whatever nation should possess this land shall serve God or they shall be swept off, when they are ripened in Iniquity. This would be written off as a Mormon fairy tale however the Native American people have always known this and strive to live by it and failed many times, long before a Mormon was a thought. I wonder where the idea came from. The next story has also been deemed as a hoax, although the reasoning of it makes no sense whatsoever, those who call it a hoax cannot provided the reasoning that it is, and there for they simply resort to a doctrine and vocabulary of last resort in order to maintain the illusion of intelligence, words such as ridiculous, frivolous, hoax etc... This story I am certain many of you have heard in the past, but many have not. I know it would seem a surprise, but I am a skeptic by Nature, However I do not believe as the world does in the orthodox ways, I never have, but I am not quick to believe that which truly is ridiculous, frivolous and a blatant lie. Some times a truth or a lie can be very difficult to discern, and for this reason I have adopted the common sense of “Prove or Disprove” meaning never to approach a thing to learn the truth of it, with an agenda or you will find exactly what you seek, even if it is a lie, Do not seek to only prove, or to only disprove, or you will find the one you favor, seek the truth. Rule of thumb, A lie when confronted with truth will always lash out revealing the lie , truth however will reveal it self and stand on its own. My reasoning for my belief in the previous legend and the following story are not due to a gullible nature ready to believe any ridiculous story that comes about, but it is because of my skeptic nature and my research tactics which does not allow me to discard any story as a hoax until common sense is applied and the principles set forth above. In addition to this, it is the many evidences that I have personally witnessed and studied from a rather large digital library of the earliest encounters with the Native Americans, legends and such but also and a key factor is my research pertaining to the Native American Petroglyphs and the study of them as a literal hieroglyphs form of writing. Very near the location of the following story which appeared in the Phoenix Gazzette in 1909, is a panel of glyphs which not only tells a history of events but is in fact a intended geographic map showing key features including 3 underground cities of the ancients, including the very undergraound city the Aztec emerged from! Two of these cities are exactly where the old Latin Maps made prior to the Spanish conquest, show they were... Yet the Spanish never found them. The locations of 4 of the Seven Grottoes of the Aztec are known by only a few. One is given in the following Article, the others I will but touch upon later herein. Keep in mind as you read the following, for years it was strongly maintained that the article did not exist and that it was made up and a hoax. Yet persistence of some finally uncovered the original article from the actual printed news paper. There was a brief period of back pedaling after this and then the story changed to being an intended hoax and some have even tried to use the date of the article as evidence of this once denied article, now as a result of an April Fools day joke, lets forget the fact that the article was released on April 5th of the weekly news paper rather than the week prior where in it would have been more fitting. Never did the Newspaper afterwards come forth stating it was a April Fools joke. Until some one challenged and proved the existence of the previously denied article MANY years later. Another argument was created in support of the article being a hoax in that both individuals mentioned in the article, S. A. Jordon and G. E. Kinkaid never existed nor had affiliations with Smithsonian. Let it suffice that not only did I find both of them, but also verified their involvement with Smithsonian. If the following were a hoax, why has so much effort been implemented to discredit it, prior to the last ditch effort in calling it an intended hoax? Mysteries of Immense Rich Cavern being brought to light Jordan is enthused… Remarkable finds indicate ancient people migrated from Orient The latest news of the progress of the explorations of what is now regarded by scientists as not only the oldest archeological discovery in the United States, but one of the most valuable in the world, which was mentioned some time ago in the Gazette, was brought to the city yesterday by G.E. Kinkaid, the explorer who found the great underground citadel of the Grand Canyon during a trip from Green River, Wyoming, down the Colorado, in a wooden boat, to Yuma, several months ago. “First, I would impress that the cavern is nearly inaccessible. The entrance is 1,486 feet down the sheer canyon wall. It is located on government land and no visitor will be allowed there under penalty of trespass. The scientists wish to work unmolested, without fear of archeological discoveries being disturbed by curio or relic hunters. A trip there would be fruitless, and the visitor would be sent on his way. The story of how I found the cavern has been related, but in a paragraph: I was journeying down the Colorado river in a boat, alone, looking for mineral. Some forty-two miles up the river from the El Tovar Crystal canyon, I saw on the east wall, stains in the sedimentary formation about 2,000 feet above the river bed. There was no trail to this point, but I finally reached it with great difficulty. Above a shelf which hid it from view from the river, was the mouth of the cave. There are steps leading from this entrance some thirty yards to what was, at the time the cavern was inhabited, the level of the river. When I saw the chisel marks on the wall inside the entrance, I became interested, securing my gun and went in. During that trip I went back several hundred feet along the main passage till I came to the crypt in which I discovered the mummies. One of these I stood up and photographed by flashlight. I gathered a number of relics, which I carried down the Colorado to Yuma, from whence I shipped them to Washington with details of the discovery. Following this, the explorations were undertaken. Surrounding this idol are smaller images, some very beautiful in form; others crooked-necked and distorted shapes, symbolical, probably, of good and evil. There are two large cactus with protruding arms, one on each side of the dais on which the god squats. All this is carved out of hard rock resembling marble. In the opposite corner of this cross-hall were found tools of all descriptions, made of copper. These people undoubtedly knew the lost art of hardening this metal, which has been sought by chemicals for centuries without result. On a bench running around the workroom was some charcoal and other material probably used in the process. There is also slag and stuff similar to matte, showing that these ancients smelted ores, but so far no trace of where or how this was done has been discovered, nor the origin of the ore.
“The tomb or crypt in which the mummies were found is one of the largest of the chambers, the walls slanting back at an angle of about 35 degrees. On these are tiers of mummies, each one occupying a separate hewn shelf. At the head of each is a small bench, on which is found copper cups and pieces of broken swords. Some of the mummies are covered with clay, and all are wrapped in a bark fabric. 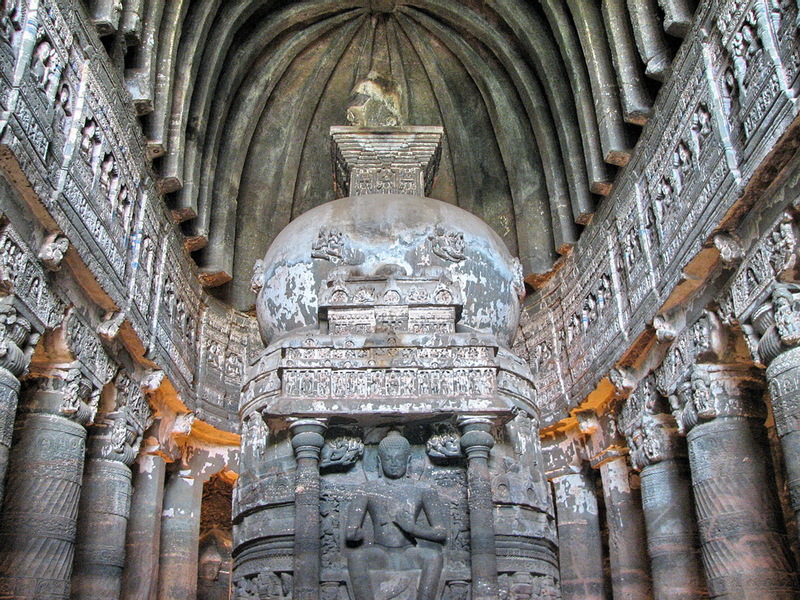 The urns or cups on the lower tiers are crude, while as the higher shelves are reached, the urns are finer in design, showing a later stage of civilization. It is worthy of note that all the mummies examined so far have proved to be male, no children or females being buried here. This leads to the belief that this exterior section was the warriors’ barracks. In connection with this story, it is notable that among the Hopi Indians the tradition is told that their ancestors once lived in an underworld in the Grand Canyon till dissension arose between the good and the bad, the people of one heart and the people of two hearts. Machetto, who was their chief, counseled them to leave the underworld, but there was no way out. The chief then caused a tree to grow up and pierce the roof of the underworld, and then the people of one heart climbed out. They tarried by Paisisvai (Red River), which is the Colorado, and grew grain and corn. They sent out a message to the Temple of the Sun, asking the blessing of peace, good will and rain for people of one heart. That messenger never returned, but today at the Hopi villages at sundown can be seen the old men of the tribe out on the housetops gazing toward the sun, looking for the messenger. When he returns, their lands and ancient dwelling place will be restored to them. That is the tradition. Among the engravings of animals in the cave is seen the image of a heart over the spot where it is located. The legend was learned by W.E. Rollins, the artist, during a year spent with the Hopi Indians. There are two theories of the origin of the Egyptians. One is that they came from Asia; another that the racial cradle was in the upper Nile region. Herein, an Egyptologist, believed in the Indian origin of the Egyptians. The discoveries in the Grand Canyon may throw further light on human evolution and prehistoric ages. Over the years I think I have just about read everything written about the Aztecs, much of which is twisted and molded into the author’s agenda. It wasn’t until I took the time to read the 3 highest regarded accounts of the Aztec records, written by qualified individuals who had access to the original Aztec recorded history. These 3 recorded histories, or one or more, are always cited as the source for much of what has been written now and in the past. These three records are, first and being my choice as least accurate although it reads very much like the other two, would be Historia Antigua de Mejico written by Mariano Veytia, Fracisco Ortega 1836. I would have no doubt his primary sources were the following two. My second favored would be Diego Durans Historia de las Indies de Nueva España, published in 1581. Although I know Diego Duran was very accurate and reads just as my favored, I just cant get past the fact that my first choice was written by a Spanish educated Aztec and of Royal descendent and grandson of none other than Moctezuma II himself, and who spoke, read and wrote Nahuatl fluently, Hernando de Alvarado Tezozomoc who wrote the famed Cronica Mexicana 1598. In order to get an accurate story concerning the Aztec, one would need to consult one or more of the records of the Aztec. I don’t know why, but the accepted History teaches that the Aztec record was all but destroyed with only a few surviving manuscripts and although the Spanish destroyed much of their written record, the Aztec took steps to preserve their history and many of the manuscripts, books, Codex etc, were immediately hidden away when they witnessed the destruction of their written record by the Spaniard. These records exist even to this day and the locations of which are still a highly protected secret. Tezozomoc and Diego Duran had controlled access to these records, but great care had to be taken as the Spanish powers under the Roman Catholic thumb would have no doubt destroyed them if they were to discover them. Why are these records so important and the documented history made by the 3 previous mentioned authors? There are so many things that have been discovered on this land since the time of the accepted first Europeans came to this land, things that just don't make sense, things that Academia is to quick to dust under the rug rather that make sense of it. From the Oak Island mystery to the Tucson Lead Crosses, from the Los Lunas Stone to the Michigan Tablets, all of these things would begin to make sense if the people just understood the true history of this Nation, and those things which are not authentic would begin to reveal themselves rather than be designated as a hoax as a last ditch effort rather than admit its authenticity and then the so called experts would have to admit that they do not know why, how or when. The story I am going to tell by summary is to be taken as nothing more than a hypothesis. at this time it is no more valid than the theories presently being pushed upon the people and taught as if it were a fact. The basis or foundation of those orthodox theories, if you were to delve into the beginnings of them and the so called evidences to support them, you would find a foundation of sand.However I will try to give you something a little more solid to build on. Who I am to tell you these things? To answer, let me ask, who are those who have presented to you the accepted truths that you might currently believe? The answer is... people, no different than I... I'm, just someone with a different perspective and perception of things due to taking the time to listen to those of our earliest records... and comparing and weighing the evidences provided by academia of the past... However the main thing that sets us apart is that I do not have to answer to anyone but my Creator. I don’t have a peer, a curriculum to follow or adhere to and I have not sworn an oath to follow some agenda with my funding being threatened to be taken from me if I do not. The fact that I have a Creator might make this much less enjoyable to the atheists, unless their mind is open to the possibilities. Unfortunately for those who push their theories of evolution, the majority of the ancients believed in an existence of a Supreme Being, and strangely enough you will find the resemblance of many biblical accounts among their legends. After this cleansing of the earth, another people were brought to this land here in the west, and I mean the west as in the area which is now Utah and its surrounding states. The people who came to this place after this great destruction came from a place according to their own record, of a great tower where the peoples language was confused. They say they were able to keep their tongue as their leader had favor with the Gods. According to another record, and a little search of the Altai Mongolian mountains, you will find their earliest leaders name, still existing in the name of places such as rivers and villages in the very area where they passed through near 4800 years ago, with some remaining behind. According to the Aztec Record and/or the many oral traditions of the Native American people, they traveled to the east, after leaving a great tower, where their God had confused their language (Legends vary in minor details) across two mountain ranges, some of their people stayed behind; they came to the coast lands where their leader ascended a great mountain where his God gave him glowing stones. [Also found among Chinese Legends and unconfirmed Altai Mongolian Legend] From this place they were told to cross the great sea where they would find a promised land. Some stayed in the coast lands of Asia and these people became the Fathers and Mothers of today’s Asian People, all stemming from what is today known as the Altai Mongolian and is according to DNA results the primary origins of the FOUNDATION of the Native American people and those of Asia. Today, if you were to mix a group of Mongolian people with a group of Navajo people, I would doubt, any one could tell them apart. According to the Aztec Record, their people consist of many migrations to this land. Two migrations are considered in the record as the primaries. The first migration was from the great tower which according to the record was in about 2400 BC and consisted of 7 families, they are adamant that they came from the west BY BOAT. The second primary migration recorded by the Aztec was in about 600 BC and consisted of 7 smaller migrations and came from the North East, and again by boat. According to the Aztec, when they first arrived on this land, they came by BOAT and landed very near what is now Las Vegas Nevada. I will let you ponder that one for a time. To my knowledge, of the many legends, written histories, origins stories, all ignored by a majority of Academia, there has never been a tribe who says they came here by way of the some Land Bridge which I might point out, is a theory and is not known if it ever existed. They built their first principle city and placed the name upon is, Anahuac. This city is thought by Academia as being in Mexico and because it has been taught for so long as fact, it is now believed by the majority even in Mexico that this is the case. This city, or should I say, the ruins of the many cities that have been built upon the ruins of the former is now known as Pueblo Grande of Nevada. It was known by the Roman colonies who began coming here as early as 100 BC as Tontonteac and this is the name you will find on the old Latin maps used by the many European expeditions of the known past such as the French and the Spanish. The first and original Americans thrived over the hundreds of years that they existed as the original people, and from occasional expeditions of others from what is considered the old world has spawned many legends of many cultures. Legends of places such as Atlantis, Avalon, and Shambala just to name a few, and always the accepted theories place them in a more believable place but it wasn’t really necessary as they are all regarded as nothing more than Myths anyway, right?. Eventually these same places which some are actually one and the same, are the Aztec origins mythical place called Aztlan (Place of the Heron). If you could ask the Aztecs in the days of the Spanish Conquest about this place, they would have told you it is very real, but today, because Academia cannot make sense of it, it is for the most part considered as a fictitious place just as the other mythical places. I find it interesting that the Nahuatl word Aztlan, and who would know how to pronounce it better than they?... Is mispronounced and taken back to the old world at different times as Av-lon and Atlan-tis, [Tis At-lan] with the suffix -tis being added in old Latin meaning having to do with or knowledge of and or from... today use of it by itself is considered a contraction of It is. Aztlan or should I say the name of as we know it today, was unknown to the world outside of Mexico until the arrival of the Spaniards with the exception of the Royal families who sent them, but the place was known long before and of the riches it contained. As early as the Days of King David and King Solomon this place was known in fact Moses knew of it. 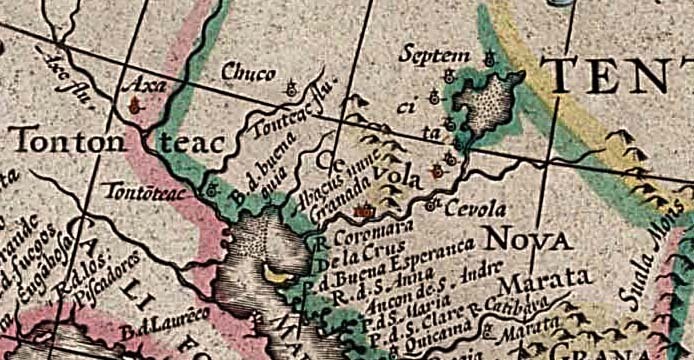 Cartographers have been mapping the Americas for as long as people have been coming here. But what was it that compelled them to keep returning and the answer is easy to see simply by understanding the weaknesses of men, Riches. Did you really think the Kings of the old world left their Kingdoms for 3 years traipsing about the old world in their crusades? It was HERE they were coming. Is it a wonder how a people can loose the Island of Avalon and the burial place of King Arthur... Isn't it amazing how the entire Asian culture can loose such an important CITY, the birth place of Buddha, Sh[e]mbahla? It is thought that those of European origin has only been in this area of the west for just over 200 years, beginning with the Spanish and French followed by those of the British Isles and then the Mormon settlers, and yet it is believed that we know of all the past civilizations that have existed here and because the belief is that man originated in Africa and spreading from there to the far reaches of the world it was believed that no advanced civilization of the past had ever existed here and yet, they discovered the ruins of the mound builders, the ancient cities of Central and South America, all highly sophisticated civilizations and all believed to have never been known prior to Columbus? It is nothing more than the pride of men that they suppose they have it all figured out. In places where it is believed man has been for thousands of years in the old world, lost cities are found, sophisticated structure of unknown origin, caves of elaborate construction and carvings such as Ajanta Caves in India were found and yet at one time they were unknown. How do such profound structures and creations of man become lost in places where man has frequented for thousands of years? How much more possible is it for civilizations of the past to have become lost in places where in it is believed that only barbaric and savage men have lived? How much more possible is for the known world to have lost or never known of vast civilizations of highly sophisticated populations of the past that might have existed here in the west? I do not believe that the Royal families of England, Whales, Scotland, France and Spain sent expeditions here all in the spirit of adventure and the hope for new discovery, I believe they knew well and good what is here, and even 500 years ago, they knew more than the so called experts of the past do today. These people knew because they all had access to the Imperial Library of Constantinople which met its final intentional destruction in 1453. In addition to the vast amount of information that was lost but much of which had been preserved, it is legends through oral tradition that many things of the past have been discovered in the old world, why should it be any different here? Here in the Americas many legends of vast civilizations exist, many which would rival the so called mythical place of A[z]tlan-tis recorded by Plato who lived in the 5th century BC. What is the origins and truth of the many mythical legends, The Golden Fleece, The Holy Grail, The Ark of the Covenant and the Fountain of Youth, all thing which men of the past considered as sane individuals went looking for... why? Did they have less reasoning than we? or is it us who is diminished in belief and become slothful in unraveling the mystery rather than resort to the labels of hoax, myth, ridiculous etc? Spanish Expedition anyone? Filming Professionals sought after. WE ARE STILL LOOKING for an ameteur to proffessional interested party to film segmants of this hunt over a five day period. I have the editing program and will be putting together promotional videos for the future. We have at least 7 interested parties however we still need to confirm. We expect a dropout or two, so we still have room for a few more... LET ME KNOW ASAP, this hunt is scedualed for the last week of August. The following is NOT a matter of fact and is for generating interest and evaluating feasibility. 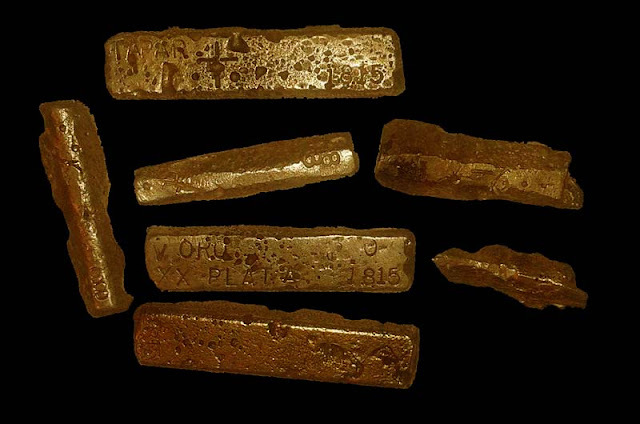 Have you always wanted to go on an actual Spanish treasure hunt? Well, this may be your opportunity. We have been kicking this around for about 1 year. Due to an over abundance of projects we have decided to open up a bit and give others the opportunity of the same thrill of the hunt we have enjoyed… We are looking for a few good people to personally participate in two unique possible upcoming expeditions. We promise nothing but a very good time and a rare opportunity at a chance to discover signs and symbols of the past, the mines they lead to, and possibly a discovery of a cache of the past left behind for unknown reasons. Below we are proposing two specific hunts, each is different in difficulty, time and cost to participate. About 18 years ago an interesting site was discovered in the northern mountains of Utah. The site showed all the signs of a possible battle between the Spaniards and most likely Indians. It is apparent however that some of the Spaniards escaped, as you will see in the following words. This likely took place in about 1815 as evidenced by certain things found at the site marked with the date in question. This is not to say however it could not have been at a later date. For the purposes of this document, we will call the expedition of the past, the Alvarado family expedition, the name of which was discovered on certain items unknown to me until just a few days ago. At this site was discovered among other things, a certain map engraved onto a religious object. It had always been assumed that the map most likely showed the general area in which it was found. At one point many years after the discovery, I was asked to evaluate the map and see if I could find its true applicable location. One thing that puzzled me about the map, is in that I have NEVER seen any historic map such as this, and made by a member of the exploring party, that did not orient the map with the top to represent north. Or, if this was not the case, even 10 degrees off of north, a “compass rose” or some indication of north would be on the map. This map was silent on its orientation. With this thought I proceeded anyway knowing I could be wrong as to the orientation. However, I did find a satisfactory fit for the map. But, the problem that always bothered me was it didn’t fit with respect to the expected orientation of the map. 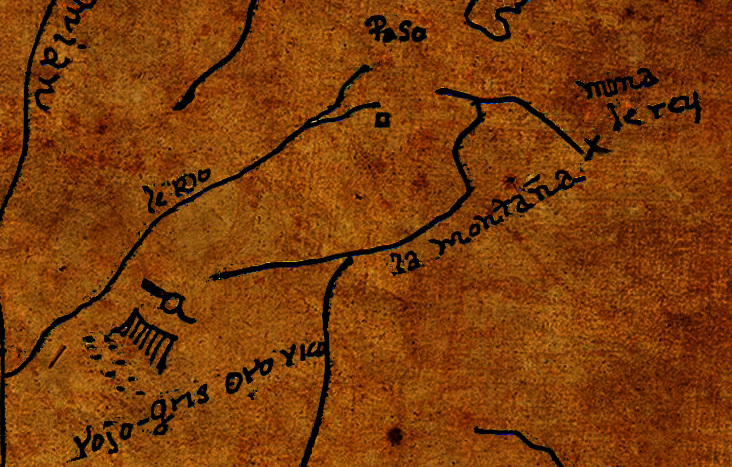 It also puzzled me as to why at the bottom of the map it had the word “Yutas”, as I knew this was never Ute country and was in fact Shoshone territory. It wasn’t a perfect fit by any means, but this was the general location believed by us for the next five to six years. Then, about five or six years ago a good friend and map collector gave me, copies of two maps bearing the Alvarado name. These maps were given to him by a Southern Utah Indian who received them from his father’s father etc… and they were said to have been taken from a massacre site near or in the southeastern part of Utah. The maps were in very poor condition. At the time my friend received them, his Indian friend carefully and exactly recreated them on newer paper for preservation, with the old ones being put away again in a safe place. Several other maps have surfaced over the past few years that show the same sites on the Alvarado maps from different expeditions and time frames. Together we have in our possession four maps all from different sources and time frames and three different expeditions showing the same things with a noticeable progression in.... well... lets say, "things"
There are two primary cache sites found upon the maps as well as significant notable mines. One of the cache sites I would tend to steer away from due to rumor that it is considered sacred to the Ute. It is a place they hold sacred due to it being a place where they say several ancestors are buried. Out of respect for the Utes, I will not go there without permission and/or support from the Utes. The other site however seems to be fair game, and I am planning an expedition to discover the mine locations that are said to be rich mines. To go to this site, we will need an outfitter. I have two excellent outfitters in mind for this expedition, to cater to our needs including food transportation, pack horses/mules and camping accommodations. I am looking for as many as six serious interested parties to participate in and help fund the operation and as little as one. If you cannot be in this expedition and simply be satisfied with being a part of the thrill of a actual Spanish treasure hunt, with a possible bonus outcome, this is likely not for you. Although we know that the information is genuine, finding the clues on location is the fun and most exciting and important part of the outing, but there is no guarantee we will find the mines or a cache. This is not rehearsed. This will be my first time in the area. But please know, I usually find what I seek and I don’t give up. On this trip you can expect to learn some of our best kept secrets as our goal is to succeed. Because the original information will be shared, it will be necessary to enter into a non-disclosure, non-competition agreement, and provide a liability release. The cost for this expedition is undetermined at this time. Again, this once in a lifetime trip is primarily for the purpose of learning and discovery. Please be advised, this trip is not for the meek, Interested parties should consider any health issues and a spirit of adventure and discovery are needed. This will be at least a 5 day outfitting trip with all your needs provided for, including some transportation. If you would like to be a part of this, please, contact me at tuscoro@gmail.com. Please bear in mind that interested parties must meet certain character and physical criteria, to be able to hike and directly participate in the hunt and work in harmony with the rest of the expedition party. We hope this article has generated interest on your part, and we want to hear from you to help determine the feasibility of the project. We intend to make some of these expeditions a filmed expedition and hope to entice professionals to come along and record it; however if not, we will use our own means and do the best we can. Expeditions of this type could range from $200 - $1800 per person for a 3 to 5 day trip catered and or non catered. We expect to offer even more affordable 1 to 3 day trips visiting Native American Glyph sites at about $20 per day and learning the basics of interpretation of the Native American Glyphs based on the theories of Lavan Maritineau and Hosted by Daniel Lowe who has for near 30 years studied the Native Glyphs as an authentic writing system, studied of the Native Legends Oral Traditions and written Histories of the Indigenous documented by those who first encountered them. These trips participants would provide their own transportation and accommodations. This expedition will be a bit easier to get to. Hence, the the cost to participate would be much less. For this selected project, just about anyone can participate if you can operate a shovel, listen to interesting stories, sit at a camp fire and enjoy yourself. This project began some years ago while investigating a certain area we became aware of due to the surfacing of a new map… The map we were investigating is a somewhat controversial one as it was made in 1863. It is not of Spanish origin. The site in question is not on the map and was only found as a result of what we learned while exploring in the area as a result. As we traveled up an old dirt road we pulled over to make a pit stop (need I clarify?). I looked to the east and noticed what was to me clearly, an old mine tunnel entrance. Yet it had been either back filled or the entrance had caved in with the passage of time. While standing at and facing the presumed entrance, I saw a small stream or trickle of water coming from the entrance - a clear sign to me that it was indeed a mine. Looking up the hill I could plainly see the tunnel direction as it has settled leaving a clear shallow gully-like indentation up the hill and about 30 to 45 feet in length. 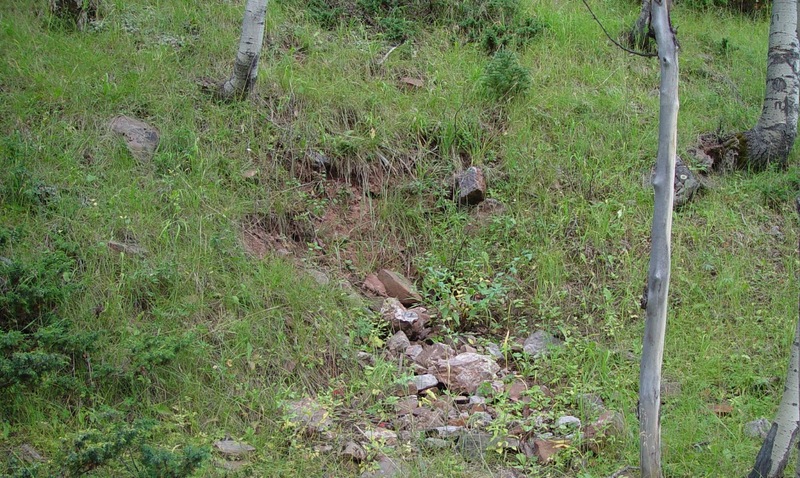 Regardless, of the reason for the indentation in the hillside, it was clear to me that it had to be dug out horizontally about 30 feet to get to the mine. Nevertheless, after pondering the possibilities, and not being much into old mines or mining at the time, I turned around and there I saw the answer in part to the seeming riddle. 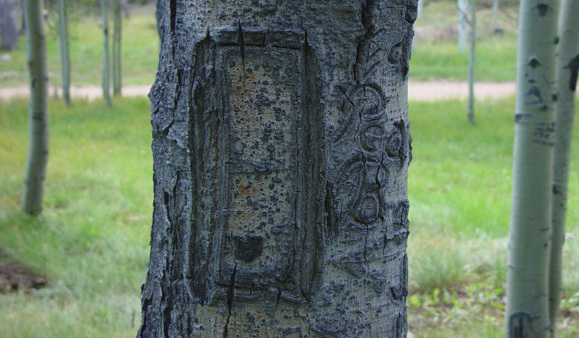 Directly facing the old suspect mine entrance, was this, on an old dead aspen. The first and foremost question that popped into my head was, is this tree old enough to bear this suspect mark of Spanish origin? Well I suppose you would have to see my findings and research concerning the potential life span of an Aspen tree. But I called in for the professional help of a friend who makes his living in range management and is absolutely trained, experienced and qualified to make such a determination. However, I admit, this tree was never sampled. But, the tree you see in the photograph below, after taking several core samples, was determined with out doubt to be just under 500 years old. Not all Aspens live this long, but some do. If you disagree and care to challenge this and call in your own experts, I welcome it. The tree carving below bears the Spanish symbol for 180 degrees. So, as you face it and turn around 180 degrees you will be looking directly at the mine entrance. At this site, I was still uncertain to the possibilities, but I noticed the symbol was cut with a single knife blade incision, something that is very important in the consideration of authenticity of the cut, but I will spare you the details at this time. Fortunately there is found on the same tree, other writings from an earlier time frame and there is a date accompanying them. These were done with a single incision as well. Notice the vertical lines of the “P” in “Peo” and “B” in the photo below. Although the vertical lines in the P and B and vertical lines of the 180 degree symbol were made with a single incision of a knife, notice the vast differences in width as the tree expanded as it grew. If I recall correctly, the P in Peo and the B were made in or about 1927. They have expanded as the tree grew, going from approximately ¾ of an inch to 1 inch in width. This represents approximately 80 years of growth and expansion of this perticular tree. 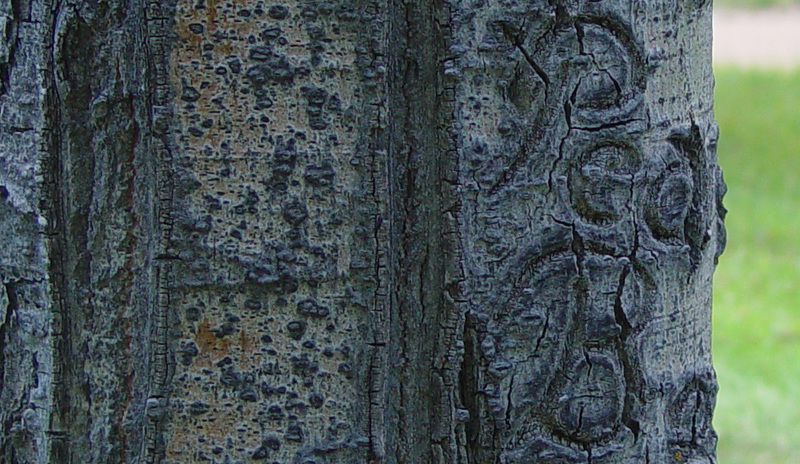 How old could the carving of the suspect Spanish symbol be with an expansion of 3 times the width of the former? I have my thoughts as to whose expedition is responsible but because there is no way to positively identify when it was carved, I will keep it as just a thought. This expedition is planned for the near future and will require actual participation in opening the old mine. All precautions for your safety will be taken. However, again, liability waivers and non-competition agreements are a must. The cost is expected to be about $20 to $25 dollars a day per person, and you will be responsible for your own transportation in getting to the site. Also, you’ll need to bring your own camping gear and personal effects. 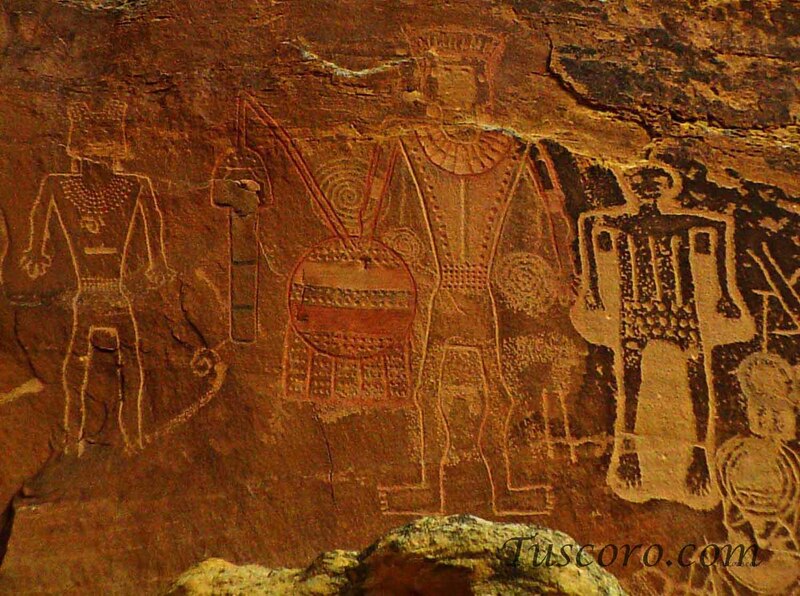 In the evenings when we are not digging, as we sit around a campfire there will be some great learning and discussion concerning the history of Spanish explorations in Utah and the Native American tribes as it relates to the meanings and understanding of the Native American Petroglyphs. It will be a great trip. Yes, with due diligence your name will be added to the mining claim.